Anything can be solved with champagne. Credit to the publicist who angled a ninety year old play into the Herald on Sunday Gossip pages. “Are age-defying celebrities Nicky Watson and Sally Ridge the inspiration for Fallen Angels…?” the paper breathlessly asks. It explains that the play “tells the story of two former BFFs who shared a lover when they were younger… Sound familiar?”, then replays the “Matthewgate” scandal. What is most scandalous about the fluff is that nowhere is the name of playwright Noël Coward mentioned, and if one didn’t know better, you’d put the paper down thinking the play really was based on the lives of Auckland socialites. 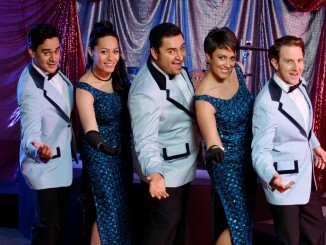 Maybe this is why Auckland Theatre Company were able to extend the play for a week before it opened? Auckland audiences have been slowly rediscovering the Cowardian comedy over the last few years: ATC last presented ‘The Master’ in 2008 with Design for Living (also starring Lisa Chappell), and Silo did their hipster version of Private Lives in 2012. In Fallen Angels, once again Coward’s genius shines through: supreme honey dipped-wit, absurd social situations, and a revealing eye on sexual politics and human hypocrisy. Fallen Angels concerns itself with Julia (Lisa Chappell) and Jane (Claire Dougan), best friends in the throes of conventionalised and predictable married life, and as Julia explains to her hapless husband, she loves him, but is no longer “in love” with him. When the women get a message from Maurice, a frenchman they both had separate flings with seven years prior, they agonise over the prospect of marital infidelity. Or rather, I should say, they agonise over how to get one past their friend; their husbands barely come into their thinking. Risqué stuff for 1925, and it invited the full force of moral rectitude. One of them remarks that it is no longer the Victorian era, but it is not the roaring twenties either. Angels plays fairly tamely; it seems obvious enough that Julia and Jane would entertain rekindling a former flame. It fits snuggly with our ‘modern’ conception of empowered female sexuality and anything goes morality. Which is more or less what Raymond Hawthorne’s production of Fallen Angels goes for, with Tracy Grant Lord decking the cast in flattering contemporary chic, against a timelessly pretentious opulent London flat (oriental styled curtains make for a picturesque backdrop of exotic birds). The dialogue, while very British, transfers well, the main element that dates the play is the comic misadventures with the telephone operator (in a nod to the original period, the calls are taken on a rather elegant antique phone). With any moral anxieties played down, what we are left with in ATC’s production is the sheer pleasure in Coward’s (three act) plotting, and Julia and Jane’s preening and scheming. The exaggerated depiction of this idle class seems removed from our part of the world – they are no Ridges, thank goodness – so we enjoy them for their entertainment value rather than any mirror effect. Chappell and Dougan have our complete attention from beginning to end, completely in sync with each other and thriving on the energy of their characters mutual jealousy and sisterhood support. They are a wonderful double act – Chappell the show woman, Dougan the master of reaction (with a twitch of her face she draws the laughs). Hawthorne has mined the script for its physical comedy possibilities, which these two acquit sublimely, particularly as the ladies get progressively drunk over dinner while waiting for their gentleman caller. Maid Saunders (Actors Program graduate Priyanka Xi) bobs in and out, a solid foil to the other women’s eccentricities. The men are very much supporting players in Fallen Angels, but tightly-wound Stephen Lovatt makes every moment count as Julia’s husband Frederick, who he has given a pronounced lean. Stelios Yiakmis’ tall stature makes him a good physical opposite as Jane’s husband Willy, but his nonchalant acting style is on a different wave-length to his co-stars; on opening night he seemed to have difficulty remaining present, and reverted to out-of-character smiling. Jonathan Allen as Maurice deftly overcomes the weight of expectation surrounding his character’s delayed entrance. 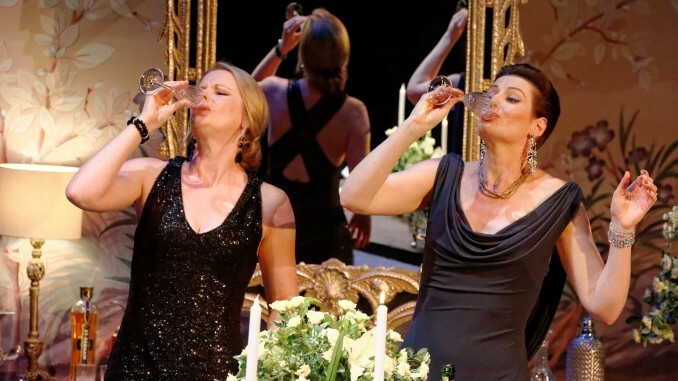 A far classier affair than anything Auckland’s gossip columns have to offer, Fallen Angels is a guilt-free indulgence of fine theatre. 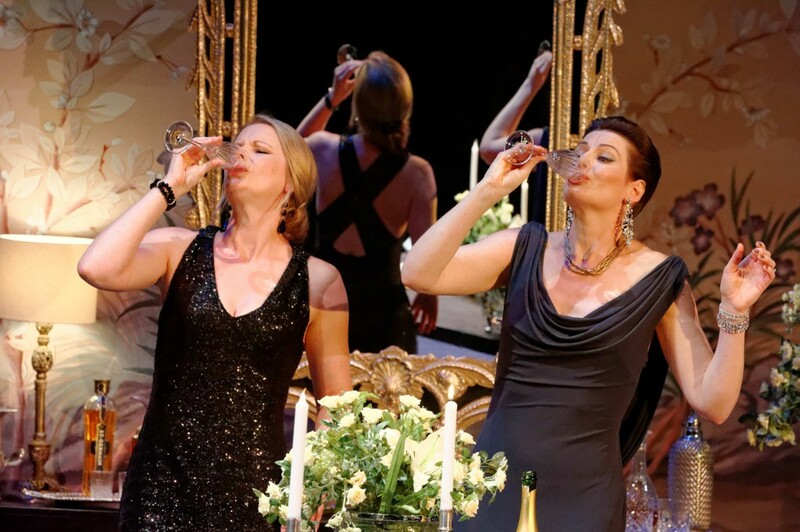 Fallen Angels is presented by Auckland Theatre Company and plays at Q until 9 March. Details see ATC.